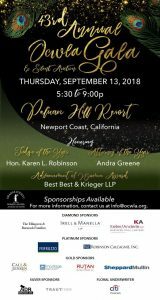 On Thursday, September 13, 2018, Orange County Women Lawyers Association will gather with members, supporters and friends for their 43rd Annual OCWLA Gala and Silent Auction at Pelican Hill Resort in Newport Coast. This year, OCWLA has selected WHW and as one of their philanthropy grant recipients, and will be honoring WHW along with Girls Inc. at their Gala. Montage Legal Group has supported WHW and helped run Suits for a Cause for close to a decade, and we are so excited that both WHW and Girls Inc. were selected for this honor. Along with its philanthropy honorees, OCWLA will recognize Hon. Karen L. Robinson as its Judge of the Year and Andra Greene of Irell & Manella, LLP as its Attorney of the Year. OCWLA has a new award this year, the Advancement of Women Award, recognizing a firm or organization working to advance women in the profession. The inaugural awardee of this award is Best, Best, & Krieger. Montage Legal Group is proud to serve as a sponsor for OCWLA’s Annual Gala, and is excited to honor all of OCWLA’s award winners. OCWLA knows it is not always practical for a solo practitioner to sponsor at the same rates large firms do. New this year, OCWLA is working to join solo practitioners together to support the Gala on the Platinum or Gold sponsorship levels, with a couple modifications. The below offer is exclusively available to solo practitioners. Platinum Solo – $355 – one seat at the Platinum Solo Practitioner table; logo combined with remainder of logos at table for a full page program ad; verbal and A/V recognition at the event will be collectively named as the “Platinum Solo Practitioners”. Gold Solo – $285 – one seat at the Gold Solo Practitioner table; logo combined with remainder of logos at table for a half page program ad; verbal and A/V recognition at the event will be collectively named as the “Gold Solo Practitioners”. There are still sponsorship opportunities and tickets left, so if you are interested in sponsoring or attending this event, please contact OCWLA Board Member, Laurie Rowen (Laurie@montagelegal.com).